Filled with art galleries, farmers’ markets and an appreciative creative set, San José del Cabo is the calmer, more laid back twin to Cabo San Lucas to the south-west. 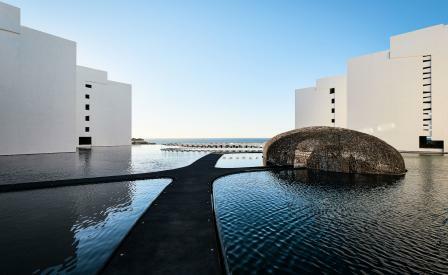 Mexican architect Miguel Ángel Aragonés reinforces this mood with his work on the new 205-room Mar Adentro. Set on the edge of the Sea of Cortez in Baja California Sur, the eight-acre resort is an all-white retreat framed by faux canals, saltwater pools, private cinema, and yoga and pilates studios. All the cube-shaped rooms front the ocean, but what sets the Mar Adentro apart from the pack is a specialist art and music programme. The public spaces are sprinkled with work by established artists and young Turks, while an artist-in-residence programme with Hotel Café provides a vibrant setting for emerging musical artists. The diversions are plenty including water-pressure massages, oil-infused beverages, clinical aromatherapy and, for those with a more prosaic bent, a beachside food truck that serves fresh fish tacos.